HAIR TRANSPLANT AND RESTORATION SURGERY, like all other plastic surgeries, is an art. It requires expert surgeon like Dr. Nicholas Agnesi, with over 25 years of surgical experience and a trained hand to create the most natural appearing results that are undetectable to even the most critical eye. Dr. Nicholas Agnesi, a renowned hair transplant surgeon, places the strongest possible emphasis on establishing a solid doctor-patient relationship right from the start, which will help guide the patient through the entire hair restoration process. Each patient is treated as a unique individual. At Advanced Hair Restoration, we realize that every patient has unique needs and desires. Dr. Agnesi is renowned for his keen aesthetic sense in performing hair transplants and his exceptional surgical skills. At Advanced Hair Restoration, we don’t do face lifts, tummy tucks, breast implants, or any other such procedures. We concentrate our energies on performing the best hair transplantation possible. We endeavor to produce a natural appearing hairline with single, one follicle (called a follicular unit) graft. We move four to six times as much hair as the standard approach, using follicular unit grafts throughout producing a completely natural result. More hair per session means a smaller number of sessions required to produce the desired result. While there are many surgical procedures for hair loss, hair transplants are the most widely accepted. Yes. The transplanted hair is removed from one area of the body (donor site) which has been genetically pre-programmed to produce healthy hair for a lifetime. Then using magnification, follicular unit grafts containing one, two, three or four hairs are meticulously transferred called “planting” into the bald or thinning areas the recipient site. 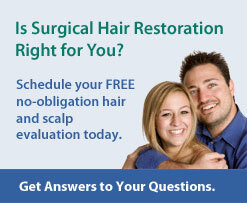 Hair transplantation is considered a “minor” outpatient surgery that takes from 3–8 hours. Patients are kept pain-free and comfortable with a gentle oral or IV sedation medication. Within six to eight months, hair transplant patients will begin to realize significant growth. At Advanced Hair Restoration, Dr. Agnesi's outstanding professional staff is thoroughly trained in the very latest hair transplant techniques. Regarding what types of grafts are to be used, we are not “locked in” or programmed to do hair transplantation with only one narrowly defined method, but rather offer to each patient both the “all follicular-unit” graft method and the “combination grafting” (70-80% FU’s and 20-30% small multi-FU grafts) approach. However, no surgeon can achieve this goal alone. Hair transplantation, perhaps more that any other surgical procedure, depends on the assistance of skilled medical personnel in a ‘team’ framework. Dr. Nicholas Agnesi, hair transplant surgeon and medical director of Advanced Hair Restoration, uses the most up-to-date hair restoration medical technology to reestablish a patient's confidence, self-esteem, and self-image. Dr. Agnesi and his experienced hair transplant staff are committed to using proven techniques and leading-edge technological advances for hair loss treatment and, more importantly, to consistently produce totally natural-looking hair. We are here to help! To meet and discuss your situation with a qualified professional, please fill in this confidential request for a free consultation. You may also contact the satellite clinic nearest you to schedule a free, confidential hair and scalp analysis.